To date there is no publically available linkage map for tetraploid blueberry that has good coverage of co-dominant genetic markers that are specifically targeted towards identifying fruit quality attributes defined as important targets by UK consumers of both fresh and processed blueberry fruit. By linking the phenotype to genotype a genetic framework for future crop improvement using marker assisted breeding will be established and this should greatly increase the speed and precision of blueberry breeding. Project collaboration with the Specialty Crop Research Initiative-funded project with partners based across America. PhD project: “Marker assisted breeding for sensory characteristics in red raspberry (Rubus idaeus)”. Research Assistant at SCRI working on an EU project entitled. ‘Single nucleotide polymorphisms for study of biodiversity of climate adaptation in trees’ 2005-2006. University of Abertay BSc (Hons) in Medical Biotechnology (First Class) 2003-2005. Petridis, A.; van der Kaay, J.; Chrysanthou, E.; McCallum, S.; Graham, J.; Hancock, R.D. (2018) Photosynthetic limitation as a factor influencing yield in highbush blueberries (Vaccinium corymbosum) in a northern European environment., Journal of Experimental Botany, 69, 3069-3080. Schlautman, B.; Diaz-Garcia, L.; Covarrubias-Pazaran, G.; Schlautman, N.; Vorsa, N.; Polashock, J.; Ogden, E.L.; Brown, A.; Lin, Y.C. ; Bassil, N.; Buck, E.J. ; Wiedow, C.; McCallum, S.; Graham, J.; Iorizzo, M.; Rowland, L.J. ; Zalapa, J. (2018) Comparative genetic mapping reveals synteny and collinearity between the American cranberry and diploid blueberry genomes., Molecular Breeding, 38, Article No.9. Williams, D.; Britten, A.; McCallum, S.; Jones, H.; Aitkenhead, M.;Karley, A.; Loades, K.; Prashar, A.; Graham, J. (2017) A method for automatic segmentation and splitting of hyperspectral images of raspberry plants collected in field conditions., Plant Methods, 13, Article No. 74. McCallum, S.; Graham J.; Jorgensen, A.; Rowland, L.J. ; Bassil, N.V.; Hancock, J.F. ; Wheeler, E.J. ; Vining, K.; Poland, J.A. ; Olmstead, J.W. ; Buck, E.; Wiedow, C.; Jackson, E.; Brown, A.; Hackett, C.A. (2016) Construction of a SNP and SSR linkage map in autotetraploid blueberry using genotyping by sequencing., Molecular Breeding, 36, Article No.4. MacKenzie, K.; Williamson, S.; Smith, K.; Woodhead, M.; McCallum, S.; Graham, J. (2015) Characterisation of Gene H in red raspberry: Explaining its role in cane morphology, disease resistance and timing of fruit ripening., Journal of Horticulture, 2, 144. Graham, J.; Smith, K.; McCallum, S.; Hedley, P.E. ; Cullen, D.W.; Dolan, A.; Milne, L.; McNicol, J.W. ; Hackett, C.A. (2015) Towards an understanding of the control of 'crumbly' fruit in red raspberry., SpringerPlus, 4, Article No. 223. Rowland, L.J. ; Ogden, E.L.; Bassil, N.; Buck, E.J. ; McCallum, S.; Graham, J.; Brown, A.; Wiedow, C.; Campbell, A.M.; Haynes, K.G. ; Vinyard, B.T. (2014) Construction of a genetic linkage map of an interspecific diploid blueberry population and identification of QTL for chilling requirement and cold hardiness., Molecular Breeding, 34, 2033-2048. McCallum, S.; Graham, J. (2014) Vaccinium spp., blueberry., In: George, R.A.T. & Fox, R.T.V. (eds.). Diseases of Temperate Horticultural Plants, CABI, UK, 5, pp 84-103. Paterson, A.; Kassim, A.; McCallum, S.; Woodhead, M.; Smith, K.; Zait, D.; Graham, J. (2013) Environmental and seasonal influences on red raspberry flavour volatiles and identification of quantitative trait loci (QTL) and candidate genes., Theoretical and Applied Genetics, 126, 33-48. Woodhead, M.; Williamson, S.; Smith, K.; McCallum, S.; Jennings, N.; Hackett, C.A. ; Graham, J. (2013) Identification of quantitative trait loci for cane splitting in red raspberry (Rubus idaeus)., Molecular Breeding, 31, 111-122. Rowland, L.J. ; Bell, D.; Alkharouf, N.; Bassil, N.; Drummond, F.; Beers, L.; Buck, E.; Finn, C.; Graham, J.; McCallum, S.; Hancock, J.; Polashock, J.; Olmstead, J.; Main, D. (2012) Generating genomic tools for blueberry improvement., International Journal of Fruit Science, 12, 276-287. McCallum, S.; Woodhead, M.; Jorgensen, L.; Gordon, S.L. ; Brennan, R.M. ; Graham, J.; Hackett, C.A. ; Rowland, L.J. ; Hancock, J.F. ; Olmstead, J.W. ; Bassil, N.V. (2012) Developing tools for long term breeding of blueberry germplasm for UK production., International Journal of Fruit Science, 12, 294-303. McCallum, S.; Woodhead, M.; Brennan, R.M. ; Graham, J. 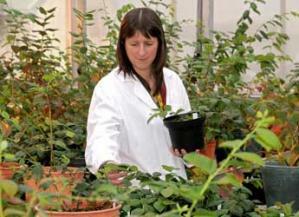 (2011) Developing molecular tools for the British blueberry industry., Annual Report of the Scottish Crop Research Institute for 2010, pp29-31. Woodhead, M.; Weir, A.; Smith, K.; McCallum, S.; MacKenzie, K.; Graham, J. (2010) Functional markers for red raspberry., Journal of the American Society for Horticultural Science, 135, 418-427. McCallum, S.; Woodhead, M.; Hackett, C.A. ; Kassim, A.; Paterson, A.; Graham, J. (2010) Genetic and environmental effects influencing fruit colour and QTL analysis in raspberry., Theoretical and Applied Genetics, 121, 611-627. Graham, J.; Hackett, C.A. ; Smith, K.; Woodhead, M.; Hein, I.; McCallum, S. (2009) Mapping QTLs for developmental traits in raspberry from bud break to ripe fruit., Theoretical and Applied Genetics, 118, 1143-1155. Kassim, A.; Poette, J.; Paterson, A.; Zait, D.; McCallum, S.; Woodhead, M.; Smith, K.; Hackett, C.A. ; Graham, J. (2009) Environmental and seasonal influences on red raspberry anthocyanin antioxidant contents and identification of quantitative traits loci (QTL)., Molecular Nutrition and Food Research, 53, 625-634. Woodhead, M.; McCallum, S.; Smith, K.; Cardle, L.; Mazzitelli, L.; Graham, J. (2008) Identification, characterisation and mapping of simple sequence repeat (SSR) markers from raspberry root and bud ESTs., Molecular Breeding, 22, 555-563.